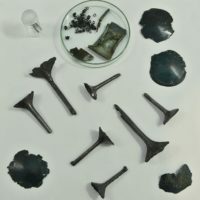 Archaeologists excavating in the village of Hozelec in northern Slovakia have unearthed a unique trove of Bronze Age jewelry. The site was excavated from April to July of this year as part of a study of Hozeleck’s history, but nobody expected to find Bronze Age artifacts. 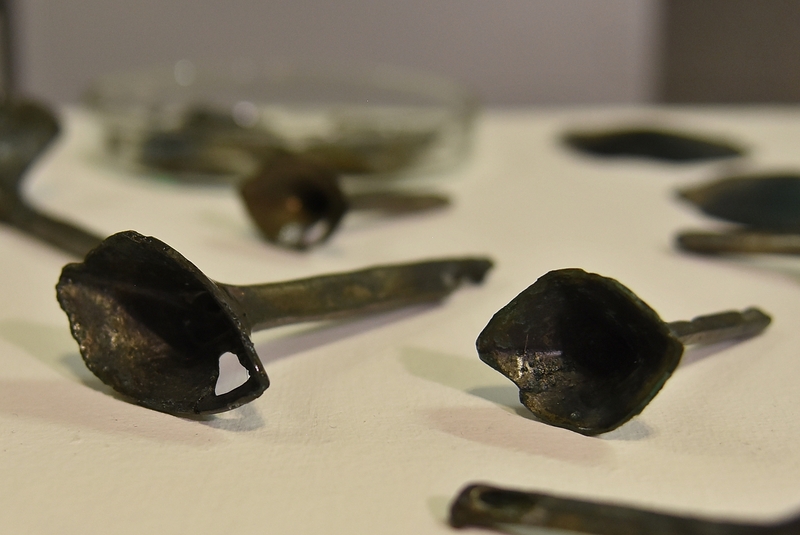 The team discovered small fragments of bronze spirals, funnel-shaped pins and three bronze discs. The funnel-shaped objects are highly unusual because they seem to be made of a white metal. It’s possible that it’s bronze with a high tin content in the alloy. Another possibility is that the alloy was treated by some means, perhaps etched with an organic acid or heated to the exact temperature necessary to raise the white metal to the surface. Either way, the whiteness of the funnel pins indicates advanced metallurgic techniques that were previously unknown in Bronze Age finds in Slovakia. Rarest of all, remnants of leather were found attached to the spirals, funnels and discs. This is likely all that’s left of the bag the spirals and funnels were buried in, with the perforated discs used to sew the top of the bag shut. The organic remains were radiocarbon dated to approximately 3,000 years ago. That dates the metal artifacts to the Middle or Late Bronze Age. It’s also only the second time ever that Bronze Age hide has been found in Slovakia, and the last time was 40 years ago. The Bronze Age pieces were discovered early in the dig. 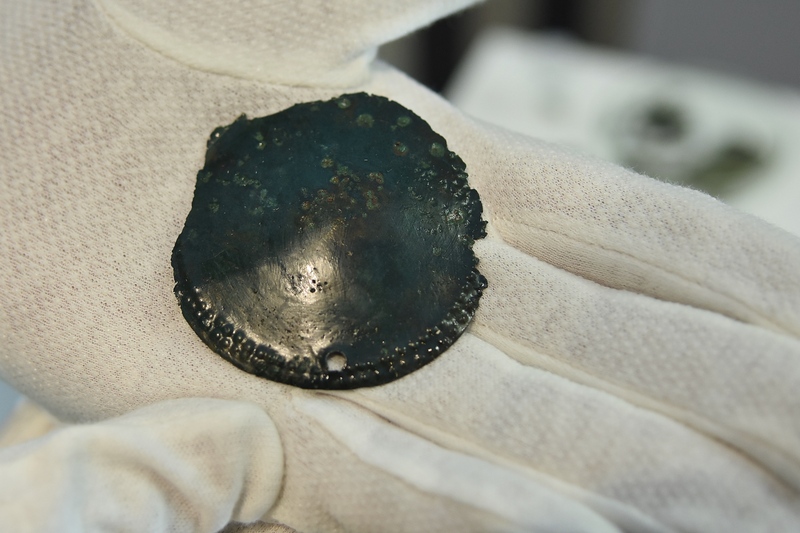 Artifacts of much younger age were discovered in subsequent weeks, including Celtic buckles, a spade, firearm and horseshoes from the Middle Ages, a 1616 solidus coin, a link chain, a copper hook, knives and assorted other objects that were likely accidentally lost. The finds have been put on temporary display at the Spiš Museum’s Historical Town Hall. Museum experts will study them further before a permanent exhibition is arranged. This entry was posted on Thursday, December 6th, 2018 at 11:36 PM	and is filed under Ancient, Modern(ish). You can follow any responses to this entry through the RSS 2.0 feed. You can skip to the end and leave a response. Pinging is currently not allowed. There has long been a mystery as to why the European Neolithic population declined so heavily before the Bronze Age invaders took over on a scale, that at least in Northern Europe, was damn near population replacement. Maybe it was the plague. Whatever this “installation” once might have been, it is exceptionally cool (even if -in all fairness- the whole thing resembles a bit of the remnants of my ruined hard-disk drive).